Macy and Thorne will reunite! There will be a love triangle between Tricia, Brooke, & Ridge. The truth about Massimo being Ridge's Father will come out. Shelia will be murdered. With the show in such a transition right now, the predictions are endless! I’m still banking on Thorne and someone like Megan getting together. I wouldn’t bet on Ridge and Brooke shacking up anytime soon. I don’t think she wants to go there, not with her progress with Stephanie and overall as a decent human being. I believe she will get involved with someone in the coming months. Let’s see, we know Tony and Kristen are on recurring status as of now, so don’t expect much from them. It’s unclear to me whether or not Matt B’s character is out completely or on recurring status. I would guess that after Ziggy got wind of all that went down, he got out of town fast, what with his fear of the police. It only seems logical that things would have been pieced together and that Amber would have realized that Ziggy was her dealer too. You know he has to feel guilty about everything that happened though. I had thought they might tie in something with his friend, Lance’s death, but that never really happened. Sibling rivalry will prevail between Mark and CJ over Bridget. Okay, that’s so obvious I don’t even know if it fits in with predictions. If Sheila actually gets away I’ll throw a book through a plate- glassed window. Okay I won’t do that, but I’ll be mad. I think Clarke will make an attempt at a relationship with his son, though you would assume Margo would have something to say about it and they can’t really bring her back since Lauren Koslow is on Days. Sally will side with CJ over the fight between him and Mark over CJ. The Forrester's will oppose a relationship between Mark and Bridget and I think I would too because it’s highly inappropriate. Mass will persist on revealing Ridge’s paternity now that he needs some serious help from his family. Stephanie will fight it as best as she can, but I believe it will soon come out. But hey, I said that like three months ago and here we are! Thomas will act out in school and his grades will suffer after witnessing Jack’s scene with Brooke and losing his mom in such a tragic way. I doubt Tricia and Ridge will get something going in the near future. I mean, that’s just kinda sick and being a grief counselor, you would think she wouldn’t get herself into that. But you know, these characters start off strong and then, down they go! We all know that Taylor is going to be killed off the show. I have already seen her on a new show that will be airing soon. By the way, she’s making a huge mistake leaving the show! Apparently, a million dollars isn’t enough of a salary for her on a soap! So, Ridge will be a free man again, and Brooke is a free woman. I think they may get back together, and why not? They have that spark! Erica knows that the Forrester's probably won’t accept her, especially with all that has happened with Amber. And now she knows her real identity, and the identity of her father, James Warwick. I think she will go to him, and let him know who she is before she will let the Forrester's know. Unfortunately, the character of James will be played by someone else. The old portrayer is now on another soap. CJ and Bridget have been getting closer and closer now. They decide that they are going to be together as they have a lot in common and have suffered in their young lives. Everything is great until Deacon returns thinking that he has sorted his life out now and that he really loves Bridget more than anyone, even Brooke, in spite of the fact that Brooke has his nameless child. When he learns that Bridget and CJ are getting closer and closer, he fights tooth and nail to get her back with him where he thinks that she belongs. -The character of James Warwick will be returning soon...I wonder how Sheila will react! Erica carries a picture around in her wallet of herself as a little girl and her dad, but you can only see half of his face. If Stephanie ever saw that picture she would recognize the little girl as Mary Warwick. After all, James and Stephanie raised Mary for awhile before Sheila skipped town with her. -I think Sheila and Massimo will heat things up as they continue to have more encounters together! Massimo will get tired of Stephanie ignoring him and begin to pursue Sheila. Stephanie will wonder who the new mystery woman in Mass's life is. I think C.J. and Bridget are headed for a romance... and she will tell C.J. about Brooke and Deacon breaking up her marriage. 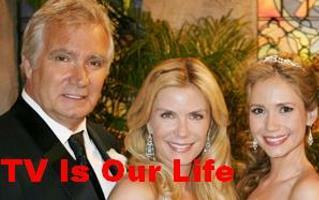 I predict Brooke and Thorne will rekindle their romance! Taylor and Amber will dig for clues about Lance and find out that Sheila Carter is behind the drugging! I predict Macy will come back to the show ( we all know she really didn't die in the car crash) -she really went to live with her father and Kimberly because she felt like she had nothing to come back to at home. Amber and Rick's idea for selling their clothes on the television works the first time but not again. Eventually, that is the reason that Forester begins to have a lot of problems. The true blue customers that have always enjoyed buying their clothes from Forester through other venues, take offence to seeing Forester's designs sold on the set! Well, I definitely see a future between CJ and Bridget. Here are several reasons why. First, they’re working together, which means they’ll see a lot out of each other. Also, Bridget’s going to live at Insomnia and I could see some working late by CJ that spills over into the room upstairs. The way the two behave around each other is another indication. It looks to me like the classic “pseudo-anger” is being portrayed by both of them (more so with CJ) that’s usually reserved to the schoolyard, but common to the soap world. The final reason is that they were both hurt by Brooke. I think Bridget and CJ were hurt at about the same level, but CJ’s anger is more apparent. So maybe in the coming months will see some happiness for both of them. Hmm, Stephanie’s secret coming out soon? I would say yes. She’s gotten away with it for long, but after leaving Mass to go be with Eric during the difficult time of Forrester being sliced and diced might just be enough reason for Mass to deal Ridge. He may also rationalize that because Eric didn’t leave Forrester to come work with Ridge, he has the right to be honest with him and be a “real father.” Hey let’s also be honest, Stephanie is in love with Eric, and not so much with Mass. Pretty soon she won’t be able to hide and Mass will see. She may have gotten away with this lie for 9 months (much longer than Brooke could), but its soap world and I doubt this one will go to her grave. What’s in store for Brooke? Not sure yet, but I doubt a man will be involved. Or at least not in a sexual way, at first anyway. I can never really tell with Brooke. The last time she was told to start helping her children (after Ridge rejected her last year, Stephanie told her to pay more attention to her kids, specifically Bridget) she ended up involved with Deacon. But perhaps the writers don’t want to totally destroy Brooke’s integrity, so maybe she’ll be on the good side for a while. Oh man is Ridge maniacal or what? The slicked back hair definitely portrays that. Will he succeed in destroying Forrester? Doubtful. It’s just too easy to do that. He’ll probably hurt them (sales wise and their reputation), but I think we’ll continue on to years of level playing field between Spectra and Forrester Creations. How will he react to the news he’s Mass’ son? Anger, bitterness, and hurt are just the few things that come to mind. I don’t think he would stop seeing Eric as a father though. Is Deacon really gone? At least for now. The amount of characters on the show has exploded in the last year and they might be slimming things down for a while. As for Whip, since the marriage isn’t officially over, and the fact that he still works at Forrester may keep him around for a while. The Sheila saga. Hmm, I could tell you what I want to happen, but I don’t think it will come true. Somehow, Sheila will manage to either get Amber back on drugs or frame her for it to stick a wedge between her and Rick. Maybe with Ziggy’s help, or maybe without. I could see something happening between Ziggy and Sheila, but it won’t be a real relationship. Sheila is still in love with Eric and in her demented mind, she probably will think there is the possibility of a future with him and with Erica and Rick. Ziggy might just be a temporary distraction or a way to get her hands on some drugs to frame Amber. Thorne? I still am holding out that Macy will come home and the two might try something again, after he gets over the fact that she lied to everyone for 2 years. More realistically though, I could see he and Megan date for a while. They’re both sweet people and would probably work well together. I also remember when Rick suggested that they set up some offices in Nevada for tax purposes, which would also be an easy route for the character to leave (if the actor decided to leave). Tony and Kristen will continue to be happy, but (and I don’t know exactly when) at some point Tony’s HIV issue will become more involved in their life. I’m not saying he’ll get sick and die, but things may change.